WARNING: Do NOT use a power inverter to power your computer when using Durametric. Switch the car’s ignition to its accessory position. If the car is a 2005 model or newer, turn on the hazard lights (emergency flashers). This will help keep the car’s CAN bus awake during diagnostics. Connect your Durametric cable(s) to the car. If you are using only the Durametric USB-to-OBDII cable, connect this cable to the OBDII diagnostic port in your car. If you are working on a pre-1996 model year car, connect the round adapter cable to the round diagnostic port in the car and connect the Durametric USB-to-OBDII cable to the round adapter cable. If you purchased the 50’ extension cable, connect it directly to the car (or to the round adapter cable) and connect the USB-to-OBDII cable to the extension cable. If you are working on a Porsche factory racecar and have the Durametric cup adapter cable, connect it between the USB-to-OBDII cable and car or between the 50’ extension cable and the car. Connect the Durametric cable to the USB port on your computer. Confirm a steady green LED at the OBD-end of the Durametric cable, that your computer recognizes the attached Durametric cable, and – with the first connection – the computer indicates the hardware is installed successfully. 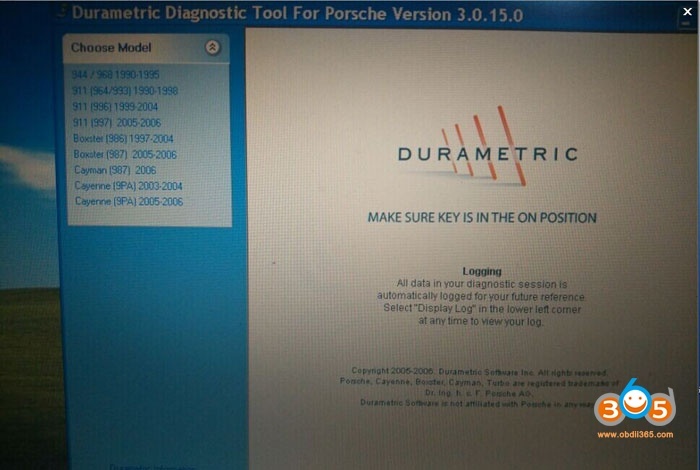 Durametric is equipped with many of the same capabilities and features of the Porsche factory tools. Upon starting the program, you will see the Durametric logo screen(s) of the main program. tool and can be directly referenced in the factory service manual or other reputable repair manuals. this information to aid in troubleshooting and to help resolve improper operation. using two icons. The yellow circle icon with the exclamation point in the center indicates an information- only fault. The red circle icon with the exclamation in the center indicates an actionable fault. Refer to your car’s service repair manual for more information on information-only faults. Codes or Erase Shadow Fault Codes option, respectively, for the control unit selected. menu option and selecting Clear faults in all units. I bought one for 20 usd, found it useful and actually reset the airbag light with it. You can also delete error codes, read a lot of live and stored performance data off it, etc etc. It’s a previous version of Durametric. It works as long as you know the limitations, major one being XP only unless you install the Durametric V6 drivers then you can get it to work on Win8 and presumably previous versions of Windows too. I’m not sure re using Durametric V6 in its entirety though, I thought you needed a specific proprietary cable for that which is why the clones are always supplied with an older version of Durametric. Useful tool if you are not willing (or needing) to commit to anything special. I have a cheap Chinese copy and it works. but it only allows me to use an early version of the Durametric software which is why it comes with the software on CD Rom. i cannot for example download version 6 from the Durametric website and use it with the copy cable. I bought something similar for E20 and it seems to work OK although I think after trying the Cd it came with I ended up downloading software from Durametic site. yes i can confirm it works fine. Ordered from them last week. Ive been able to reset my airbag, sort service light etc and saved me an expensive trip to my local Porsche dealer. Used this. direct off obdii365.com not resold and marked up. Yes if your car is listed it will generally work, but you need Win XP ideally though bodging some drivers for a later version of Durametric gets it to work on Win 8. Looking into this for you, I downloaded Durametric 5 or 6 and used the drivers. Or just source a cheap Win XP laptop. “YMMV” but if you just want to fool around no harm in trying. I got some interesting info off this, and also reset an airbag light (oddly, via 993 model selection despite being a 996). My conclusion, if you are half hearted about this and don’t really see the need to splash out on a Durametric kit, then yes, this is worth having, and useful. 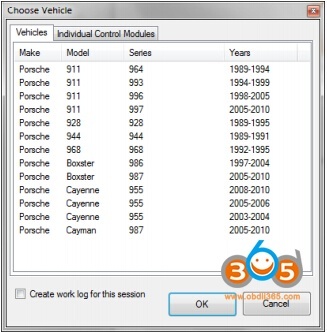 How to Register , Activate and Update Xtool A80 H6 OBD2 Scanner?